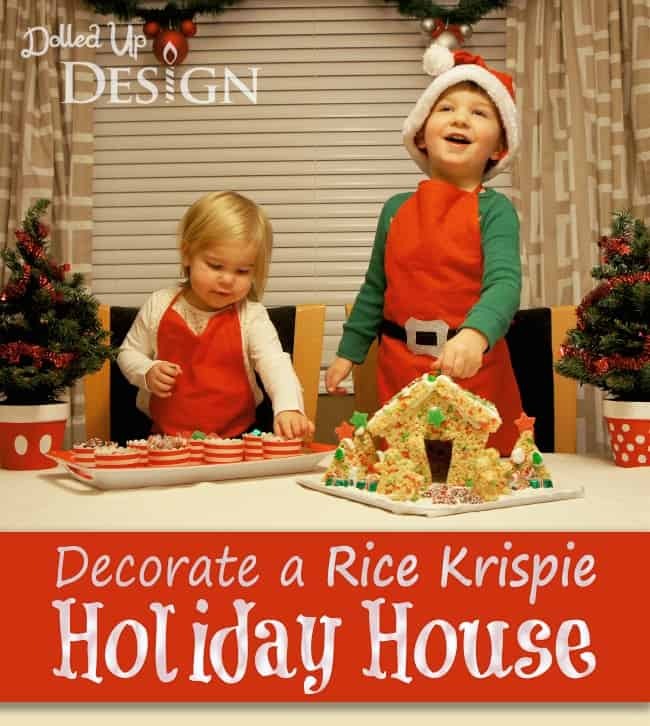 This Rice Krispies House post is courtesy of our contributor Chantelle…Christmas is quickly approaching so I wanted to share one of my favorite activities from last holiday season: decorating a “gingerbread” house made from Rice Krispies Treats! It was a fun, easy and, most importantly, very tasty! 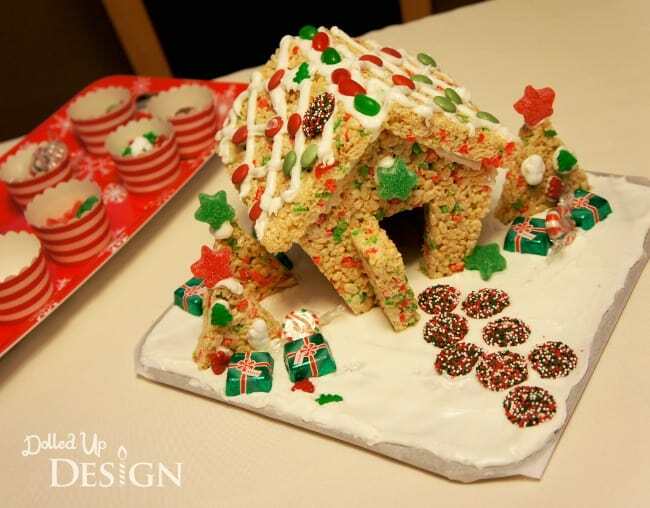 I love the idea of a gingerbread house, but am not too fond of the idea of cutting and baking all that gingerbread. There are pre-baked kits available, but they never taste as good and I always struggle with getting the walls and roof glued together so they aren’t sliding and collapsing while I decorate. 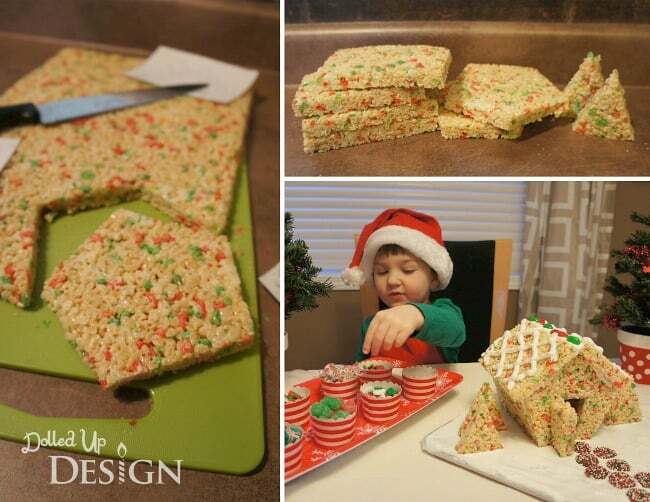 I used the standard Rice Krispies treats recipe with the green and red speckled Holiday Rice Krispies. I spread it out on a parchment lined cookie sheet and, once set, I simply cut out the four walls and two roof pieces with a sharp knife. My Rice Krispies house walls were thicker than your typical gingerbread walls and, because the marshmallow makes them slightly sticky, it couldn’t have been easier to assemble my house. With a bit of royal icing to cement things together, I built my house up on a foil wrapped piece of cardboard and then we were all ready to decorate! To decorate the house, I had taken the kids to our favorite bulk foods store and let them help me select a variety of Christmas shaped gummies, jelly beans and chocolates. I helped apply the royal icing, and my son worked carefully to adhere the different candies to our house, sampling along the way! 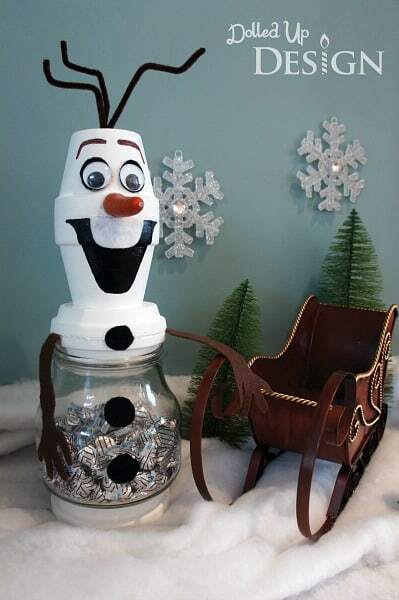 My then 3 year old had a lot of fun with this project and I think it would be such a fun idea for an activity at a kids holiday party. 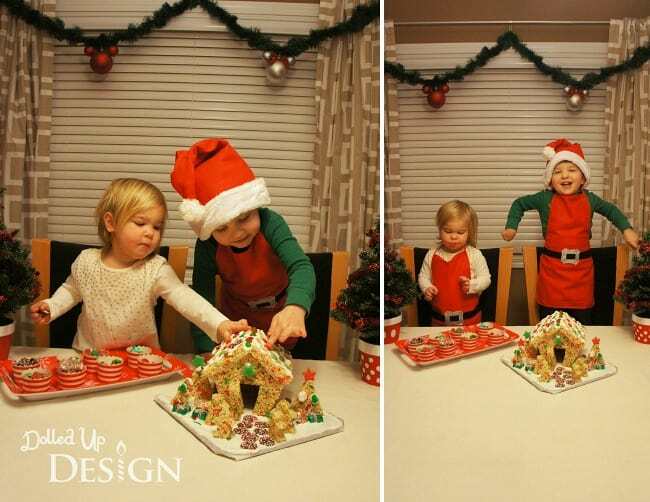 Depending on the size of your party, you could even simplify things and just cut gingerbread men or other Christmas shapes from the Rice Krispies treats to have the kids decorate. 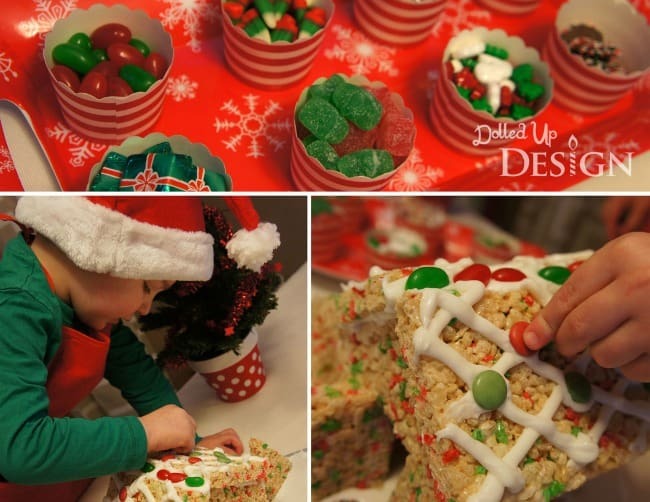 Set out icing and candy in small dishes and let the kids have fun making their own creations. And don’t forget the aprons – I found the adorable kid sized Santa aprons and hats in the seasonal section at the Dollar Store! Gingerbread is a holiday staple in a lot of homes, but hopefully I have sold you on the idea of switching up the traditional gingerbread for a Rice Krispies house this year. And if you feel you’ll be missing the ginger part of the Gingerbread house, you could even try this Gingerbread flavored recipe from the Rice Krispies website. Get creative, have fun, and don’t forget to share your creations with the #Treats for Toys campaign! 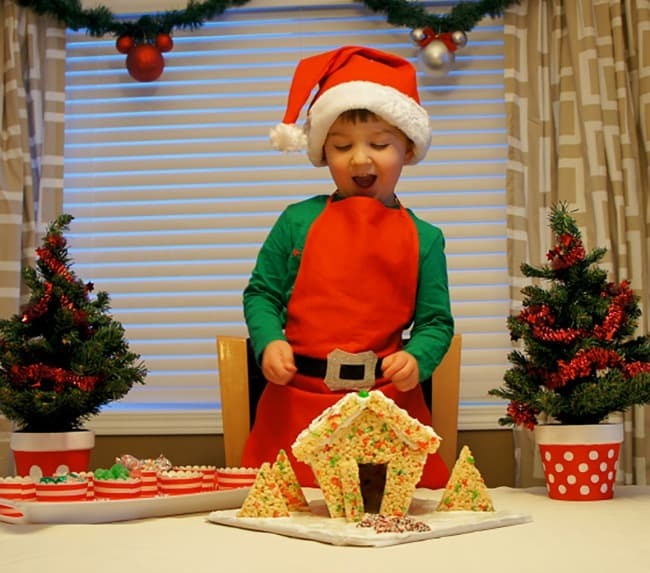 We’d like to send a huge THANK YOU to Chantelle for sharing this fun holiday idea with us. There are a lot more where this came from – visit her on Facebook to see the latest ideas for fun crafts, party ideas and more!